I’m on cloud nine right now after cooking the most delicious whole duck roast. This is the first time ever I’ve cooked duck in my kitchen. I’ve had duck a couple of times in restaurants- Chinese style and Italian style- honestly, I didn’t like that much it was too bland for me. Duck has a much intense taste and flavor than chicken. The other day, while grocery shopping, at the meat section I found this beautiful young duck. I couldn’t resist it and it couldn’t resist me and we bonded well. I always wanted to cook duck, at least once in my kitchen and finally that happened. While thinking of what to make with the beautiful duck, the thought of Kuttanadan style duck roast hit me over and over. Kuttanad is a place in Kerala known for its backwaters and lush greenery, duck roast is one of the delicacy of Kuttanad. I was so excited to make Kuttanadan style duck roast and I’m so glad that I did; the duck roast turned out beyond delicious. I first marinated the whole duck with some simple spices and pressure cooked in the Instant Pot. After that, made a rich and creamy gravy with onion-tomato and coconut milk. 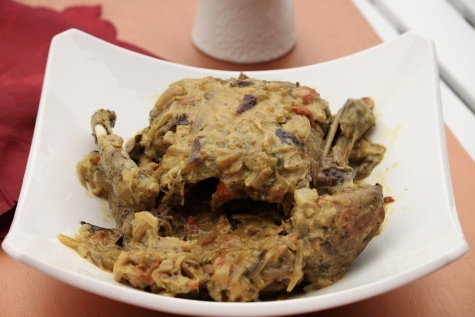 Slow cooked the cooked whole duck in the coconut gravy. I’ve to tell you guys, I’ve fallen for duck- however, only if it’s made this way- Kuttanadan style. My man loved the gravy so much, along with the gravy the duck tasted incredible. This is a must try, I swear you are going to love it. The whole duck I used weighed 4 lbs or 2 Kgs. I skinned the duck and rinsed it under running water. In a small bowl: combine together: 1 tsp garam masala, ½ tsp turmeric powder, 1 tsp ground pepper, salt and lemon juice. Spread the marinade over the whole duck inside and out. Let marinate for 30 minutes or 1 hour. I used Instant Pot to cook the whole duck. You could use a regular pressure cooker as well. Place the marinated whole duck into the stainless steel pot. Add 3 dried bay leaves and 1 cup water. Pressure cook at high pressure for 20 minutes. After 20 minutes, let the pressure release naturally- takes about 15 to 20 minutes. Open the lid and keep aside the cooked whole duck. Place a large pan or wok over medium heat. Add coconut oil, add ginger, garlic, green chilies, curry leaves and bay leaves, saute till light golden. Add small onions and saute till golden in color. Add onions sliced, season with ½ tsp salt. Let onions turn light golden brown. Add tomatoes, cook till mashed. Add garam masala, turmeric powder, coriander powder, ground pepper and salt. Combine well and cook till onion-tomato masala turn light brown. Add ½ cup duck broth and combine well. Have a taste and add more salt if required. I added ½ tsp more salt. If you want it to be spicy add more ground pepper. Lower the heat and let cook for 2 minutes. Place the cooked whole duck over the gravy, spoon the gravy over the whole duck. Close the wok with its lid and slow cook for 15 minutes. After 15 minutes, open the lid, combine everything well. Remove the wok from the heat, keep it covered for a few minutes. Serve the whole duck roast along with the gravy on a platter. 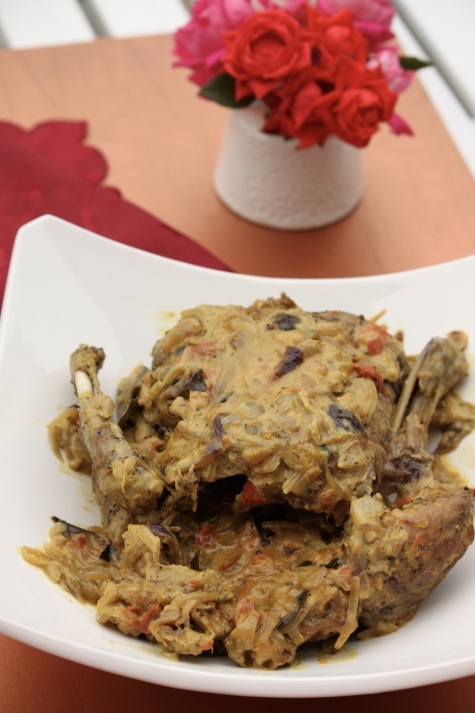 Enjoy this delicious whole duck roast along with ghee rice, basmati rice, chapati, appam, palaada etc. You can replace duck with chicken- in the Instant Pot, cooking time for whole chicken is 15 minutes.